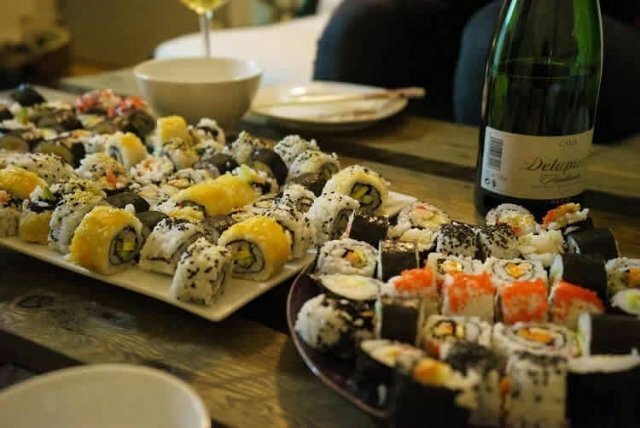 A sushi restaurant in Germany has banned a customer for eating too much food. The customer was an ironman athlete called Jaroslav Bobrowski. He visited the Running Sushi restaurant in Bavaria last weekend. He paid 15.90 euros (about $18.49) for an all-you-can-eat buffet meal. Mr Bobrowski then sat down and ate nearly 100 plates of sushi. When he went to pay for his meal, the owner told him that he could no longer return to the restaurant because of how much he ate. He told a local newspaper: "I'm banned from now on because I ate too much." He said the decision of the owner left him feeling "stunned". He told reporters that he was a regular customer at the restaurant. Mr Bobrowski said he ate so much because of his ironman diet. He follows a diet where he does not eat for 20 hours and then eats until he is full. He had no problems eating at the restaurant on previous visits, but the last time, the manager decided the amount he ate was not good for business. The owner told a German news agency that: "He eats for five people. That is not normal." A newspaper said the restaurant waiter did not accept a tip from Bobrowski when he went to pay. Bobrowski said: "When I went to the checkout, I wanted to leave a tip, but the waiter did not want to accept it." He now needs to find another restaurant that provides delicious and good value meals.